Offering you a complete choice of products which include metallizing job work. 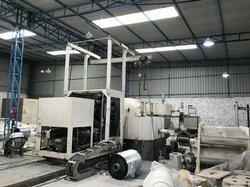 We have two Roll to Roll Vacuum Metallizing Machines of sizes 1250mm and 1650mm. We provide metallizing service on Polyester, BOPP (Biaxially Oriented Polypropylene Films) and PVC (Poly Vinyl Chloride) from 4.5 microns to 100 microns. Looking for Metallizing Job Work ?